View More In Tiles - Page 2. 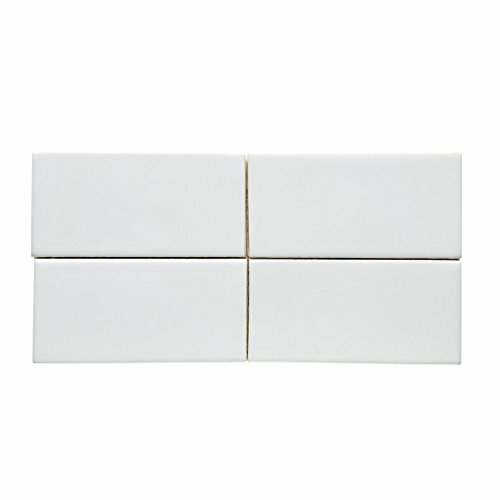 Measurements: 3" x 6" x 1/4" Material: White Clay Color: White/Mykonos Finish: Glossy Collection: Architectonics Vendor Name: Waterworks Vendor SKU: 02-07266-18757 Original List Price: $21/SF Listing Includes: 10SF Additional Details: Dust-Pressed. Hand finished and glazed by skilled artisans. Versatile decorative elements, expansive palette. Machine made and hand glazed ceramic tile line exclusive to Waterworks with a palette of 123 colors. White tile body, square edges and flat surface create a subdued and reliable background. Very compact and with only 8% water content, has the strength to permit thinner proportions. Installation Details: Grout joints should be sealed with Miracle Sealants Porous Plus after installation and periodically as needed. Clean the surface with a non-abrasive, mild and PH neutral cleanser such as Mirasoap from Miracle Sealants; do not use bleach or acids. For a thorough understanding on specific care and cleaning options, please refer to the TCNA (Tile Council of North America) at www.tileusa.com. Using a dark contrasting grout is not recommended. It could stain the white tile body and effect the glaze color along the edges.